Patent applications can be a terrific way of getting an early glimpse at what Sony is cooking up in their vast R&D laboratories, providing a first look at the Vita’s back touch panel, and at the PlayStation Monitor. This time, the US Patent Office has revealed something incredibly different – a PlayStation controlled interactive toy. 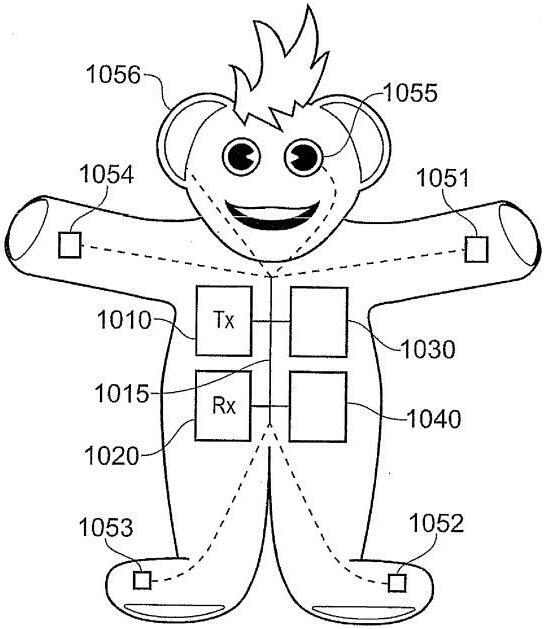 The interactive toy openly draws inspiration from the Microsoft ActiMate, which failed to sell when it was released back in 1997, with the patent mentioning the ActiMate’s several times. The success of such interactive toys depends on there being a good range of titles for the toy to interact with both at launch and into the future. It is also dependent on whether parents will buy a comparatively expensive toy whilst believing it will require further purchases of videos to maintain their child’s interest. The present invention aims to mitigate or alleviate the above problem. Should the product ever become a reality, it could include a storage medium reader, a media content player, a wireless receiver and a processor – which could even be a “cell processor”. Where a toy is not licensed to interact fully with a media disk, the PS3 can issue generic interaction instructions that follow the spirit of the interactive content on the disk, allowing the toy for example to give generic positive and negative comments as appropriate. This avoids frustration by the user, who as a child is likely to be unaware of and unconcerned by licensing issues. Thus alternatively or in addition, rather than sending a specific instruction to perform a specific action, the PS3 could send a more abstract instruction such as ‘act surprised’ that is interpreted by the toy according to the resources it has available – for example, the ability to throw up its arms, or to select an appropriate phrase from a built in vocabulary. More generally, such a layer of abstraction can simplify and reduce the amount of supplementary data needed, as it allows each type of toy to react in character without the need for different supplementary data tracks. A number of such basic responses could be codified and pre-programmed within suitably enabled toys. The processor may allow it to sense light levels, have image recognition as well as has voice recognition and/or speech recognition. It may also be able to respond with a predetermined vocabulary of words or have speech synthesis. While the PlayStation Toy may never see a release, it’s still great to see what Sony is planning, as well as giving us a look at a product that could revolutionize EyePet and other virtual games, as well as opening the PlayStation 3 up to the huge market that is children’s TV.